The 2016 Ecoboost Turbo has the 310hp 2.3L EcoBoost turbo 4-cylinder engine, diamond-mesh aluminum dash panel, blade-style body colored rear decklid spoiler, and LED fog lamps to name a few. Available packages include an EcoBoost Performance package which adds front air splitter, unique 19" ebony-black painted wheels, updated dash panel with more gauges, and more. A 50 Years Appearance package is also available. 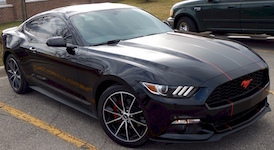 Shadow Black 2016 EcoBoost Mustang coupe owned Michael Devine by from Livonia, Michigan. This is our featured Attitude Of The Week for the week starting March 20, 2016. It has the 2.3L Turbo engine and an automatic transmission. Micheal adds, "I bought it last week on my birthday. My 5th Mustang, and if I would predict, this one will stay mine a LONG time. I owned a 2012 GT, and wish I hadn't traded it in for a different car (Audi). The Audi only lasted a month, the seat was just a pain in the... I added Big Worm striping, painted up the brake calipers, and plan to tint the windows and add a spoiler. The I-4 turbo is very peppy at 310hp, certainly enough power. Who needs 435?" Oxford White 2016 EcoBoost Mustang convertible owned by William Sanseverino from Las Vegas, Nevada. This is our featured Attitude Of The Week for the week starting April 3, 2016. William special ordered it. William adds, "I purchased January 2016; major options are an automatic transmission, navigation, backup camera, backup sensors, paddle shifters, and premium interior. It is definitely the most advanced and solid Mustang convertible I've owned to date." William owns this 1975 Mustang II as well. This is a great photo set of a 2016 Mustang convertible EcoBoost premium in Guard green/gray exterior paint. Under the hood is a 310hp 2.3L turbocharged 4-cylinder engine.